I just got my first nexus phone (6p) on 3/24 and am loving it. Out of the box, I got the January security patch and the update to 6.0.1. But I haven't gotten the February or March security updates OTA yet. Anyone have any ideas why? I've manually checked for updates, but it comes back with no updates. I know I can load them myself, but would prefer OTA. Should I be expecting this much of a delay for even the February update? FWIW I'm in the same boat. 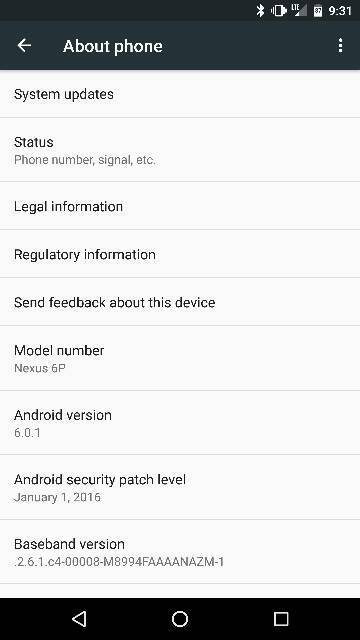 Got my Nexus Wednesday of last week and I'm also 6.0.1 w/ January security update. It can be two weeks-even more. We never get our updates until the middle of the month: N5, N5X, and N6P. Since one was issued on the 18th, you may get that one and be caught up. Unlike flashing an image, sideloading doesn't require the bootloader to be unlocked, and you'll retain all of your data. Ditto. Received my phone 3/15, set up, installed updates but it seems I haven't received the latest updates yet. I've also been manually checking. I read somewhere that sideloading the February update forced the March one to download. For some reason, the phone isn't getting the February update and therefore also can't get the March one. Was in the same situation here--got the 64gb Nexus 6P about 10 days ago and was stuck on January. I just did the side load found on another thread here http://forums.androidcentral.com/nex...ed-know-4.html and it worked perfectly--as soon as I installed the February update and booted it downloaded the March update after a minute and is fully up to date now. For anyone who wants to do it, it is easy, and if you follow the directions, you can get it done in about 30 minutes. Maybe someone can help me, i get all the way thru to sideload the OTA, last step is to adb sideload (file name).zip but when i do that i says error loading file. Everytime. Tried unhooking the USB from my PC and reconnecting and still the same thing. What do i need to do?? I had that happen too, I restarted the phone and did everything from the console again and it worked the second time. Just make sure your computer sees the phone in adb and that you followed the steps to have have full access to the phone debugging. Make sure you don't plug the phone in until after selecting the ‘Apply Update from ADB’ option, and that the OTA file is located in the ADB & Fastboot Tools directory. Also try renaming the *.zip you downloaded to ota.zip. I agree. Others were getting the March update a few weeks before mine finally showed up. Be patient, they will show up eventually. Im still on January update. Havent gotten February or March update as of yet. Yeah, I also read that sideloading February will push march. I'll give it a shot tonight and update tomorrow. Worked like a charm and got the March OTA update right after. Thanks! Did the February sideload and March downloaded immediately after the feb update installed. So I'm good to go from here out. Make sure you set the usb options in the notifications drop-down menu. It defaults to charging only. Change it to Transfer photos. Also, you may need to disconnect and reconnect the phone. I'm tossing my hat in and subscribing in case there is a solution that doesn't involve wiping the device. Ironically, I just switched from a BlackBerry Z30 yesterday with the primary goal of receiving updates directly without going through Verizon. The adb option doesn't wipe the device--that's why I did it that way instead of using the factory image. Exactly. The only additional steps are enabling developer mode on the phone and installing the tools on your PC or Mac. I didn't have to wipe my phone to do it. You're not flashing the stock image, rather sideloading the over-the-air update. Why can't I establish a data connection after Marshmallow update (Galaxy s6)? I've recently returned from abroad and now my text messages get a 'failed' reply when I try to send.